I am sure you are well aware the Insurance Premium Tax rate increases from June 1st from 10% to 12%. Once this was announced, back in 2016 we made the necessary internal changes to Move Administer to ease the pain of this increase. If you invoice your removal customer in May for an May move then the IPT rate is 10%. If you invoice your removal customer in May for a June move then the IPT rate is 12%. If you invoice your removal customer in June for an May move then the IPT rate is 10%. If you invoice your storage customer in May for May then the IPT rate is 10%. If you invoice your storage customer in May for May to July then the IPT rate is 10%. If you invoice your storage customer in May for June then the IPT rate is 12%. If you invoice your storage customer in June for May then the IPT rate is 10%. The general rule is that the rate of IPT is decided upon the commencement of the contract and not the date/tax date of the invoice. In October 2015 HMRC confirmed to me that if you are quoting in October for removals taking place in November then you can quote IPT at the new rate of 9.5%, so I don’t see this increase any being different, therefore you can quote for work from June onwards at the new IPT rate of 12%. However, to do this, I would recommend you create a new tax code (Tools -> Options -> Accounting -> Tax Codes) and set the rate at 12%. Your default IPT code will remain at 10%, but if you know the customer is moving on or after June 1st you can change the IPT code from within the quotation itself, also remembering to change it on any additional service you may be charging insurance and therefore IPT. We are over the moon that 2 of the 3 above are Move Administer users, and past winners too with Kilmarnock looking to be the first back to back winners, and Maidmans looking for their third victory in the competition. Maidmans were also a finalist of the Commercial Mover of the Year 2017 award too, a competition where fellow Move Administer user Specialised Movers picked up a Certificate of Merit. And at the BAR Annual Conference held in May the winner was announced – congratulations to Squab Group for taking the coveted prize of Domestic Mover of the Year 2017. May we also take this opportunity to congratulate all those that made it to the closing rounds of all Mover of the Year competitions for 2017. 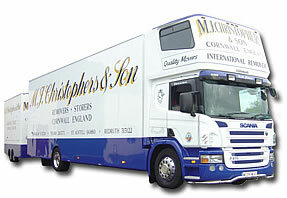 M.J. Christophers & Son of Newquay are the latest company to go live on Move Administer! A 3 user system, complete with Shipping Administer was chosen to replace their existing system, Remstar, for which we offer a complete data transfer utility, and a full day's training was provided split over 2 consecutive days. It's great to be of service to Mike and his team at M.J. Christophers & Son once again! S&A Removals & Storage Ltd of Nottingham are the latest company to go live on Move Administer! A 2 user system was chosen to replace their manual system, and a full day's training was provided split over 2 consecutive days. This expediture came as a result of a glowing recommendation from David Dale Removals, thank you David! P. Goddard & Sons Ltd of Brentford, Middlesex is the latest company to go live on Move Administer. Goddard's are one of Britain's oldest family run removal companies, dating back to 1815, hence the wonderful tagline of "Moving you since Waterloo". After a successful trial period, a glowing recommendation and talking to us at The Movers & Storers Show, a 3 user Move Administer complete with Survey Administer was purchased, complete with a full day's training, split over two consecutive days. We look forward to being of service to everyone at Goddard's.